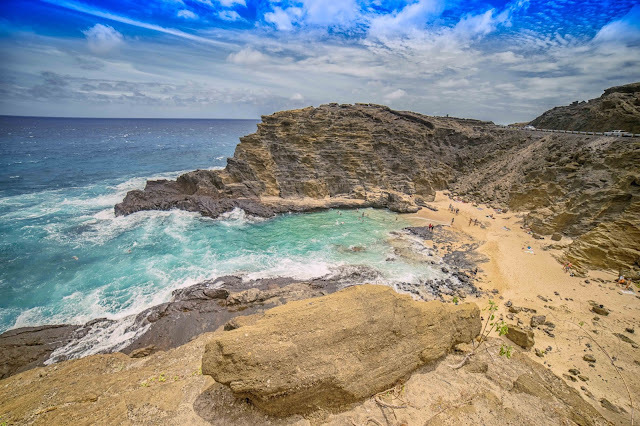 Hālona Cove is the small cove with a white sandy beach just to the right of Hālona Blowhole on O’ahu’s south east side. It was made popular by the classic movie From here to Eternity, filmed here in 1953, where the “famous kiss in the surf break” between Burt Lancester and Deborah Kerr occurred. Because of the movie, the beach was nicknamed Eternity Beach. Other films include Drew Barrymore and Adam Sandler in the movie 50 First Dates, Pirates of the Carribean 4, and the music video for Nicki Minaj's "Starships". Hālona is one of the most dangerous ocean currents in the world. Its name is Ka Iwi, or commonly the "Molokai Express", for its legendary power to carry the unwary to Molokai . Wade in the water but don’t swim here. The rocky point to the west of the beach cove is called Bamboo Ridge. It is a popular fishing spot since 1920. The location was named after the fishermen's bamboo fishing poles that could be seen along the edge of the cliff in the past.